This delightful book (48 pages) is the perfect companion for any visitor to our beautiful little island. Gilly showcases the top 20 places to visit in Antigua with original colorful drawings and interesting and informative discriptions of each local. You can order this book by clicking the red order books button at the bottom the this page. 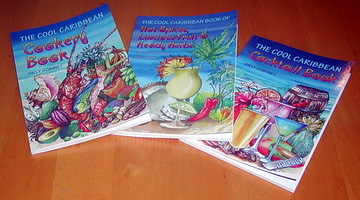 The Cool Caribbean Cookery Book won the Gourmand Award for “Best Illustrations” on Sunday April 13 2008 in London at the “Gourmand World Cookbook Awards”. The Gourmand World Cookbook Awards received thousands of books this year from 107 countries. Antiguan artist Gilly Gobinet has won the Gourmand Award for ‘Best Illustrations’ in her ‘Cool Caribbean Cookery Book’ at the Gourmand World Cookbook Awards, held recently at the London Book Fair, Olympia. It is the first time an Antiguan has won this award. Gilly’s award winning book was up against tough competition from 21 countries and was also the only book where content and art work were from the same author. Gilly Gobinet is best known for her painting and writing, which, combined with her love of cooking, has resulted in the very colourful and often entertaining ‘Cool Caribbean Cookery Book’. The West Indies recipes, some more complicated than others but all simple to follow, use mostly fresh, indigenous products, such as ginger, mangoes, pineapple, chilli, cocoa, bananas, lobster, soursop, rum, coconuts etc. that give Caribbean cuisine its distinctive taste and appeal. Beautifully illustrated with classic watercolours interspersed with humorous cartoons, this small but functional book features her own recipes and those of friends and chefs mainly from restaurants and resorts in Antigua and a few in St. Kitts & Nevis, St. Lucia and Grenada. Each of these fun but functional Caribbean books contain 48 pages full of West Indies recipes, cocktails and fascinating (and often hilarious) information on products such as ginger, limes, pineapple,chillis, sugarcane, nutmeg, bananas, coconuts, breadfruit - and one very particular heady herb! All three of these beautiful West Indies recipe books are illustrated in full colour by the artist using her classic watercolour technique as well as her own humorous cartoons. Friends and chefs and barmen from restaurants, bars and resorts in Antigua & Barbuda, St. Lucia, Grenada and St. Kitts & Nevis are featured in the Cookery Book and the Cocktail Book. 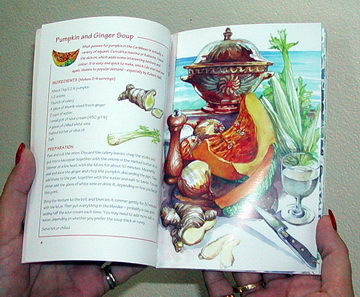 The Book of Hot Spices, Luscious Fruit and Heady Herbs was written and researched by Anthony Richards and illustrated by the artist Gilly Gobinet. These make terrific gifts ! These unusual and creative recipe books make terrific low cost gifts for your friends, relatives and for those perennial events such as birthdays. Order several of these wonderful books now !